Our Dark Tales: Edgar Allan Poe's The Masque of the Red Death Walkthrough contains all the cheats, hints, and tips you need to solve this troublesome mystery and discover who the real villain is in this tiny French hamlet. Rely on our easy-to-understand, chapter-by-chapter instructions, comprehensive puzzle solutions, and custom screenshots marked with all key item locations to learn the true nature of the mayor and the man in the red mask who stalks him. Welcome to our Dark Tales: Edgar Allan Poe's The Masque of the Red Death Walkthrough where you'll discover all the cheats, hints, and tips you need to solve this troublesome mystery. Rely on our easy-to-understand instructions, simple puzzle solutions, and custom screenshots, all marked to display key item locations to help you solve the mystery in this stunning hidden object adventure game. 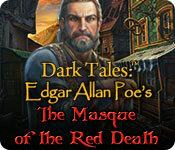 We hope you enjoy our Dark Tales: Edgar Allan Poe's The Masque of the Red Death Walkthrough! 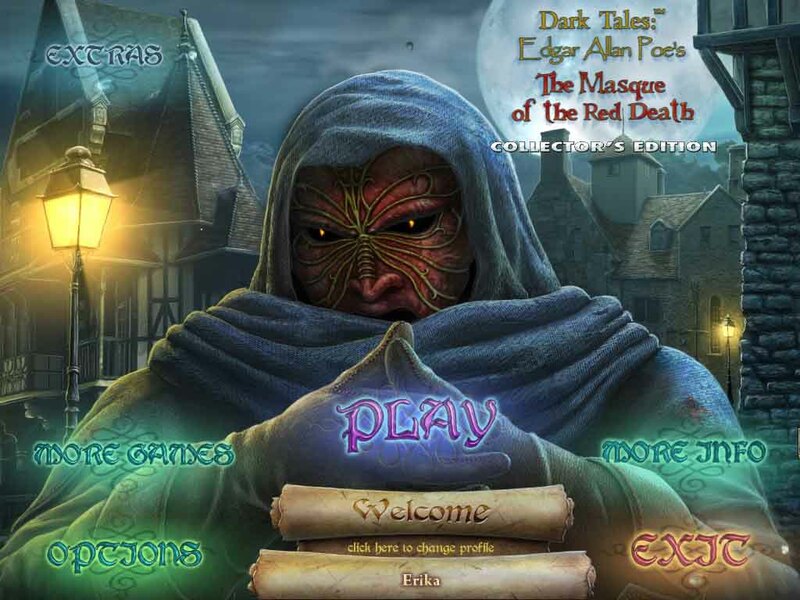 In Dark Tales: Edgar Allan Poe's The Masque of the Red Death, you've been called once again to the aid of Detective Dupin, this time to a tiny hamlet, where several officials have been murdered by a man in a red mask. However, instead of being afraid of the masked man, the townspeople treat him as a hero who will free them from the tyranny of the mayor and his lackeys. Now, it's up to you to solve this mystery and discover who the real villain is. Is it the man behind the mask or is it the mayor himself? Find out with the help of our Dark Tales: Edgar Allan Poe's The Masque of the Red Death Walkthrough! Difficulty - Three modes: Casual, Advanced, and Hard. In Casual Mode, sparkles indicate active areas and the hint and skip buttons charge quickly. In Advanced Mode, there are no sparkle indicators and the hint and skip buttons charge slowly. In Hard Mode, there are no sparkle indicators and the hint and skip buttons charge very slowly. Camera - Your camera is located in the bottom left corner of your screen. Click on it to take a picture of whatever you want. Your pictures will be stored in your private office in the photo album. Private Office - Pictures you take with the camera will be stored here as well as any awards and achievments you may gain as you play. Click on the red gem icon in the upper left corner of your screen to access it. Move back to exit. Journal - Your journal can be found in the lower left hand corner of your screen. Game notes and observations that you make throughout the adventure can be found here. You can also access a map of the village here as well. Map - Your map can be accessed through your journal. Just click on the icon on the right to access it. You can click on any scene to fast travel to that location. Eye - When your cursor turns into an eye, it means you can zoom in and take a closer look on an area. Navigation Cursor - When your cursor turns into an arrow, it means you can move in that direction. Inventory - Your inventory can be found at the bottom of your screen. Hover your mouse over it to bring it up. Click the padlock to lock it in place. Hidden Object Scenes - Hidden object scenes will sparkle. Items in blue will require an extra step in order to find them. Mini-games - During mini-games, if you can't figure out the puzzle or don't feel like trying to solve it, you can click the skip button on the right to skip the puzzle and move on. And those are the basics for playing Dark Tales: Edgar Allan Poe's The Masque of the Red Death. We wish you good luck and hope you enjoy our Dark Tales: Edgar Allan Poe's The Masque of the Red Death Walkthrough!